In AR's early years perhaps this would have been something of a circus - potentially long lines and no guarantee that you would have had an opportunity to get in front of somebody for an appraisal, let alone make an appearance on TV. 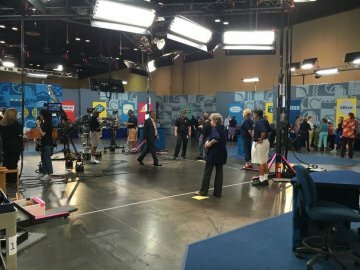 But, however things were at one time, this Season 18 event was well organized, and everybody who attended was guaranteed a face-to-face with an appraiser. 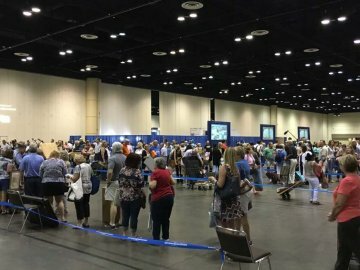 This required registering several months in advance for a ticket drawing, a hoop we successfully jumped through, then arriving at your scheduled session. Ours was 3:00 pm. The actual TV set was fairly small - perhaps 1000 or so square feet? - and constructed of perimeter back drops which, by the way, concealed the fact that there were many more people and far more real estate outside the set than inside. I presume that this was contrived to give the appearance of a more orderly, perhaps chummier milieu than it otherwise would've been. When we arrived, we were shown into a very long but surprisingly fast moving line that, as it moved closer to the set, was divided into item categories. It was most interesting observing what other people were bringing. For example, a gentleman behind us brought a portion - some of the most valuable pieces - of his Pez collection. It was obvious that he knew more about the value of his collection than any Roadshow appraiser ever would, and I learned a few things from him myself, but he had an agenda: He wanted to get on TV to give more exposure to and perhaps generate more interest in this collecting niche. This got me thinking about why people bring what they do. Presumably, in most cases, it's because they want to know what their items are worth, and if you bring something valuable, the more clueless you are about its value going in, the more potential, it seems, there is for good theater - and also the more likely it is that you will end up on TV. This, of course, is the reality of reality TV, and often reality is bent way out of shape, though AR, I think, bends it less than most. Me, I didn't consider this in advance. I suspect the Pez guy didn't either. I brought two items that I already knew were valuable. My reasons for attending were twofold: Get an up-close look at how one of my favorite TV shows was produced and get second, hopefully educated opinions on what my items were likely worth. Once I got to the books and manuscripts table, the first item I showed the appraiser (a Bonham's book specialist) was a no-brainer - a ca. 1920's copy of Albert Einstein's Relativity signed and dated by him on the front free endpaper. No shortage of comps for this, and the auction estimate he gave me landed within the realm of my expectations. Karma was good. It sold the following week. The second item, however, was something that I suspected going in might be a good candidate for a TV appearance. It was a rare booklet compilation of 12 of the first published photos from space, showing, among other things, the curvature of the Earth for the first time. This is the skinny on it: Shortly after WWII, German V-2 rockets were captured and brought back to the proving ground at White Sands, New Mexico to investigate what was then a rocket technology well advanced of our own, and a number of them were launched. During this process several attempts were made to mount cameras to the rockets, and these photos were the result. If this wasn't the holy grail of US space history, it was at least in the ballpark. After diligent searching, the only comp I could find - and it was an unsold copy - had a price tag of $30,000. I wanted a second opinion because this seemed ambitious. I assumed that any appraiser I showed this to would have never seen it before, so I brought a printout of the information I had compiled about it. And I was right in my assumption. The Roadshow appraiser had never seen it but thought it was, in his words, "cool" - in fact, he said so several times, with emphasis. "This is cool." Again, his auction estimate was more down to Earth - $10,000 to $15,000. If it interests you, this was purchased at an estate sale. It was in a Ziploc bag with several other Naval items, priced at $3.50. When it sells, the liquidator will be receiving a surprise thank-you check. But no TV for me. In retrospect I think I understand why. 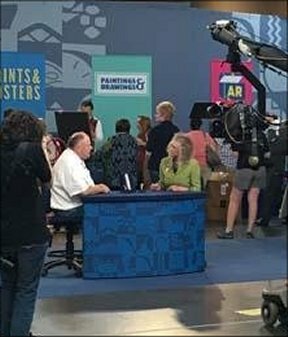 I'm guessing that the best scenario from an Antiques Roadshow perspective would be to have not only a clueless owner but, for dramatic effect, also an AR expert present to inform the clueless owner of the item's value, perhaps take his or her breath away. Not so for un-clueless me - or the Pez guy. Coincidentally, shortly before I got my appraisals there was an elderly lady behind me hyperventilating because she was about to go on camera. A producer was rubbing her back, attempting to calm her down. I have no doubt that this made good theater, and she was primed to gasp when informed of her item's value. If you get an opportunity to attend one of these, I highly recommended it. It was just ... fun, and it can't hurt to get second, or even first opinions from what are genuine experts in their fields. A word of warning: If you bring art work or jewelry, expect a significantly longer wait getting in. However, if you bring two items, one of which is not art or jewelry, get in line for that, and once you're on the set you can then move to the art or jewelry station with minimal or no waiting, that is, you won't be required to get in another line to enter. My line - books and manuscripts - was one of the shorter ones, and I was out of there by 4:15 pm.